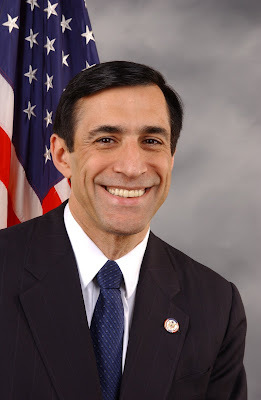 Rep. Darrell Issa (R-CA) sent a letter to Obama’s chief of staff, Rahm Emanuel demanding a response to a Politico article stating that Emanuel used “Chicago-style” tactics to intimidate the state of Arizona after Arizona Senator Jon Kyle (R) expressed negative opinions about the stimulus and how the stimulus money is being spent. In the letter, Issa tells Emanuel that Washington, D.C. is not a Chicago political machine. In my view, this is an important step. Issa called it as he sees it: intimidation through “Chicago-playbook tactics.” Most importantly, he is demanding a response from the nauseatingly haughty Rahm Emanuel. We’ll see if he get is. Written on U.S. House of Representative, Committee on Oversight and Government Reform letterhead and dated August 4, 2009. As you know, Senator Jon Kyl (R-AZ) recently raised questions about the failure of the stimulus and suggested on a national television show that stimulus money scheduled to be spent in future years ought to be returned to the American taxpayers. Following Senator Kyl’s remarks, according to Politico, you coordinated an “assault” on Senator Kyl and other critics of your policies by directing four cabinet secretaries to write to Jan Brewer, the Governor of Arizona, asking pointedly if, in light of Senator Kyl’s remarks, Governor Brewer wished to forfeit taxpayer money directed to Arizona by the stimulus. These tactics have been characterized as “a fist to the nose” and a message to “Back off.” While this type of scare tactic may work in Chicago, it will not work to intimidate me or other Members of the United States Congress. At the risk of adding to the “weeks of frustration” you’ve reportedly felt in response to criticism of the Administration’s ineffective and wasteful policies, please allow me to bring the facts about the stimulus to your attention. In selling the stimulus package, the Administration promised the Congress and the American people that the legislation would create or save 3.5 million jobs and prevent the U.S. unemployment rate from rising above 8%. I thought the outdated and discredited Keynesian economic theory behind your effort was misguided and I opposed the stimulus. Unfortunately, recent economic data has validated my opposition.-The U.S. economy lost 433,000 jobs in June, bringing the unemployment rate to 9.5%. These job losses come on the heels of other declining economic indicators, and bring the total number of American jobs lost since President Obama took office to over 2.6 million. [A]fter seeing Kyl and House Minority Whip Eric Cantor (R-VA) again paint the legislation as a failure on Sunday talk shows, White House chief of staff Rahm Emanuel directed that the letters from the Cabinet secretaries be sent to [Governor] Brewer, according to two administration officials. At what point do you believe your practice of Chicago-style politics violates a public official’s right to speak out in favor of alternative policies? The American people have a right to know what role you played in developing the threatening letters to Governor Brewer and whether you intend to continue to engage in these tactics in the future. Since I represent a district in the great state of Califomia, I hope that you will not take this letter as an indication of Governor Schwarzenegger’s position on stimulus funds dedicated to California nor his position on any other public policy issue. I can assure you that any attempt to intimidate me or silence my criticism of the stimulus through such Chicago-style tactics will be futile. 2. A full and complete explanation of the development of the four July 13 letters from the cabinet secretaries to Governor Brewer, including but not limited to the role you or any other White House official played in writing the letters or encouraging the writing of the letters. 3. All records and communications between you and Secretary LaHood, Secretary Salazar, Secretary Donovan, and Secretary Vilsack referring or relating to the decision to send the July 13 letters to Governor Brewer. 4. A full and complete explanation of the role of the Democratic National Committee and the White House Office of Political Affairs in authoring, encouraging, facilitating, or directing the four July 13 letters from the cabinet secretaries to Governor Brewer. Earlier this month, at the direction of White House Chief of Staff Rahm Emanuel, four cabinet secretaries fired off letters to Jan Brewer, the GOP governor of Arizona, citing Kyl’s critique and asking if the state still wanted the funds. Read a portion of the letter from the Committee on Oversight & Government Reform, with a link to the full text in pdf – which is what you see above.